Kairos USA is part of a growing global movement. 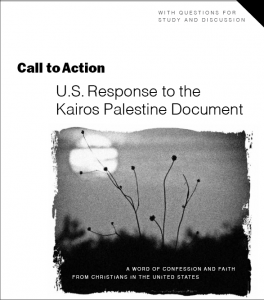 In December 2009, the Christians of Palestine brought forth “A Moment of Truth: A Word of Faith, Hope and Love from the Heart of Palestinian Suffering.” U.S. clergy, theologians and laypersons gathered in 2011 to write our response to the Palestinian document. In gratitude for the courageous witness and call to action issued by our Palestinian sisters and brothers, church movements in southern Africa, Central and South America, Asia and Europe have responded to the call of our sisters and brothers in Palestine, issuing their own statements of faith and calls to action in response to the Palestinian document and in witness to the injustices in their own national contexts.